Tabebuian - ZineWiki - the history and culture of zines, independent media and the small press. 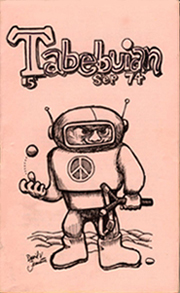 Tabebuian was a science fiction fanzine by Dave Jenrette and Mardee Slolnick. Tabebuian was published from 1973 to 1977 in Miami, Florida. U.S.A. At least 27 issues were released during this time. Contributions of writing came from Jodie Offutt, among others. Regular features included book reviews, Gothic book reviews, and "Silly Weapons of the Past". Spider Robinson, in his collection of writing, By Any Other Name (Baen Books 2001), wrote, "People keep sending me their fanzines—amateur publications concerning sf and related subjects, and spanning the spectrum from mimeographs to four color offset. As with amateur efforts of any kind, some are just dreadful and some are sublime. One of the most piquant I have seen is a little 'zine out of Florida called the Tabebuian. It is the size of a pocket-calculator instruction pamphlet, much better printed, published by Mensa members Dave and Mardi Jenrette. I can attest to the fact that David's sense of humor is D. Jenrette. I wrote him a letter asking why, if Mensa people were so smart, they had named their organization after the Latin word for table (mensa) rather than mind (mens, an early example of unconscious sexism). He replied that the club's name is in fact derived from menses, and refers to their periodic meetings. (I gave this riposte a standing ovulation.)" Darroll Pardoe, in Checkpoint 54 from October 1974, called it, "Small, pink, litho and full of wondrous things." This page was last modified on 22 March 2014, at 11:15.